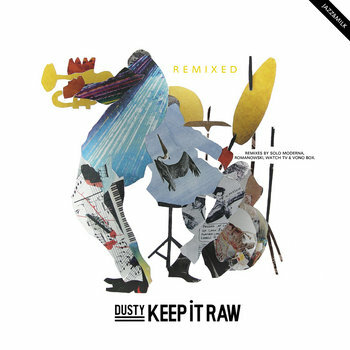 Dusty’s Keep It Raw EP gets an amazing remix treatment by some of the good names out there. We believe that Solo Moderna took the title seriously when doing his remix for „Loco Para La Pista“ – this is something crazy for the dancefloor and it absolutely works! Medicine man Romanowski from San Francisco collected special herbs on Voodoo Island to brew his great remix of the track called „Voodoo“. Watch TV, the man from Spain turns the the jazz driven „Tap Tap“ into a smashing and progressive piece that is just waiting to be played out loud! Last but not least the guys from Vono Box are keeping it raw, adding the right dose of phat beats and effects to the title track. Once again, this record bridges the gap between melodic jazz grooves and „clubby“ productions!